If the high beams, daytime running lights, or headlamps are not working consistently, you may need to replace the headlight switch. The headlight switch, commonly referred to as the dimmer switch, is the electronic switch that is responsible for controlling the vehicle’s headlight functions. They are most commonly found as a part of the combination switch lever that is usually mounted on the steering column, however they can also be found as buttons or knobs mounted on the interior of the vehicle. The switch usually controls the vehicle’s interior lights, the running lights, the low beam headlights, high beam headlights, and in some vehicles the automatic headlight system. As with any electrical switch, with regular use, it may eventually wear out and need to be replaced. Usually a bad or failing headlight switch will produce a few symptoms that can alert the driver of a potential issue. One of the most common symptoms of a faulty headlight switch is issues switching between headlight modes. If the headlight switch fails or wears out it can cause problems operating the headlights. A broken switch may only work on certain modes, or may cause them to come on and off intermittently and erratically. Any problems with the vehicle’s lights can become a safety hazard due to the decrease in illumination and visibility. Another symptom of a bad or failing headlight switch is issues operating the high beams and more specifically, issues keeping the high beam engaged. Most headlight switches operate by pulling the lever backwards and locking it into place to activate the high beam headlights. Over time however the switch can break, which can lead to issues keeping the high beam headlights turned on. A broken switch may still be able to turn the high beams on, however a faulty switch may pop loose and cause the high beams to disengage. Another symptom, one of more serious issues, is vehicle lights that do not work at all. If the headlight switch completely fails it may prevent all of the vehicle’s lights from functioning. 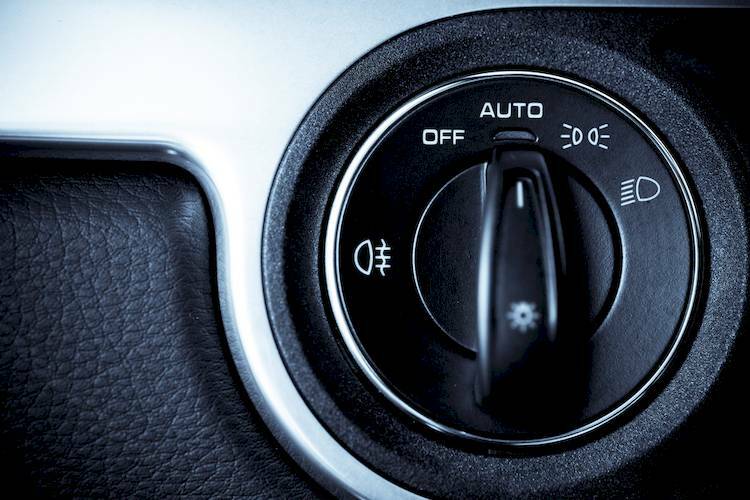 You may find that when you go to turn on the headlights, none of the modes will turn on any of the lights. A vehicle without any functioning lights is not safe to drive, especially in low light and nighttime situations. Usually a faulty or problematic headlight switch will produce quite noticeable symptoms, however sometimes other problems can produce the same symptoms. If you suspect that your headlight switch may be having an issue, have the vehicle inspected by a professional technician, such as one from YourMechanic, to determine if the switch should be replaced. Q: My tail lights stay on even after car is off. The hazard lights and turning signals all work but the brake lights do not.